Please help raise money for post-secondary scholarships for the class of 2019 and beyond! IF $10,000 is raised SUPERINTENDENT DR. STITT WILL WALK 25 MILES AND BIKE 25 MILES IN ONE DAY! We are also in search of corporate sponsors ($5,000 or more) who will receive additional benefits. SUPERINTENDENT DR. STITT WILL WALK 25 MILES AND BIKE 25 MILES IN ONE DAY TO RAISE FUNDS FOR THE CLASS OF 2019 & BEYOND! Who can donate? Anyone can donate any amount to support this Scholarships Program. Individuals who donate $50 or Corporate Sponsors at $5000 or more will receive special benefits! Why should I donate? Students beginning with the Class of 2019 will benefit with scholarships toward post-secondary institutions or trade schools. In addition, this a tax deductible way to support the youth of our community in a fun way! When/Where will this event take place? 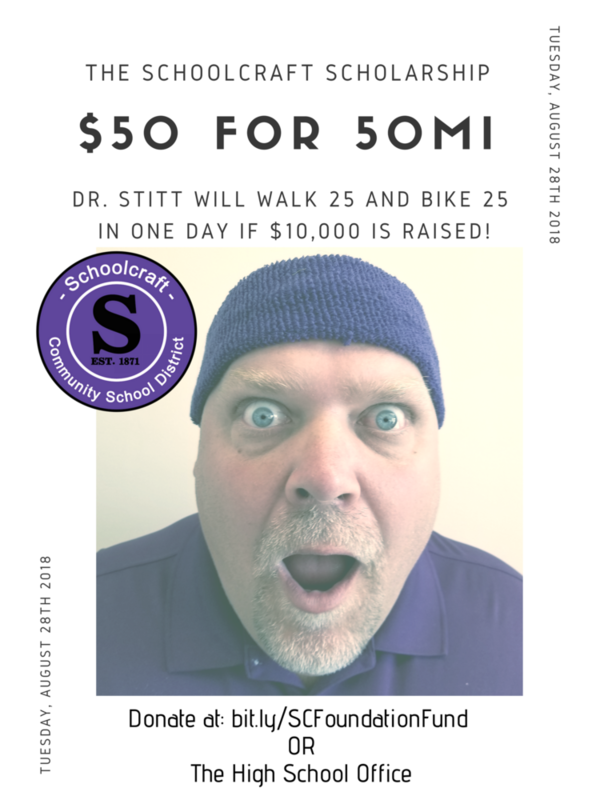 Dr. Stitt will begin his journey on the HS campus early the morning of Tuesday, Aug 28th and will finish his 50 miles of fundraising at the Community Back to School Night the same evening. All are welcomed to join him for a portion of the journey! Go Eagles! Go Eagles! Go Eagles!